Rome, April 10th (askanews) - An online petition and gatherings in front of the Italian embassies to ask for "justice for Medhanie Tesfamariam" Behre, the Eritrean migrant detained for three years in Palermo on the charge of being one of the main traffickers of human beings from the Horn Africa to Europe, Medhanie Yedhego Mered, known as "the general". Thus the Eritrean diaspora is mobilizing these days on social media, claiming that Behre is the victim of a personal exchange. The young Eritrean migrant, arrested in Khartoum, Sudan, in May 2016, was extradited to Italy in June of the same year. The day after his arrival in Italy, the migrant's sister, Segem Tesfamariam Berhe, contacted by askanews in Khartoum, had said: "I want to tell the Italian police that my brother is innocent, that it is not the Medhanie they are looking for." And he had sent the identity documents as proof of his statements. 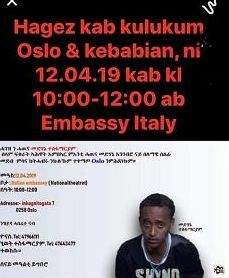 On 4 April, Elias Arefaine, an Eritrean living in Oslo, also launched a petition to the Italian government on Change.org, which has so far collected almost 28 thousand signatures, asking "the release of the innocent Medhanie Tesfamariam". In the appeal for the San Francisco gathering, posted on Facebook by another migrant sister, Eden Tesfamariam, we read that Medhanie "is still detained in Italy for a personal exchange". "To fight against this injustice, we collected and provided evidence, as did the wife and son of the trafficker," he added, referring to the testimony given by the trafficker's wife, according to which the man in prison is not his husband. And to the DNA test performed on the son, who ruled out any link. "The brother and sister who live in California invite you to protest and show that he was arrested for a personal exchange and that he must be released. We will meet in front of the Italian Embassy at 2590 Webster St, San Francisco, on April 11th 2019, at 10 am, ”concludes his sister's appeal.